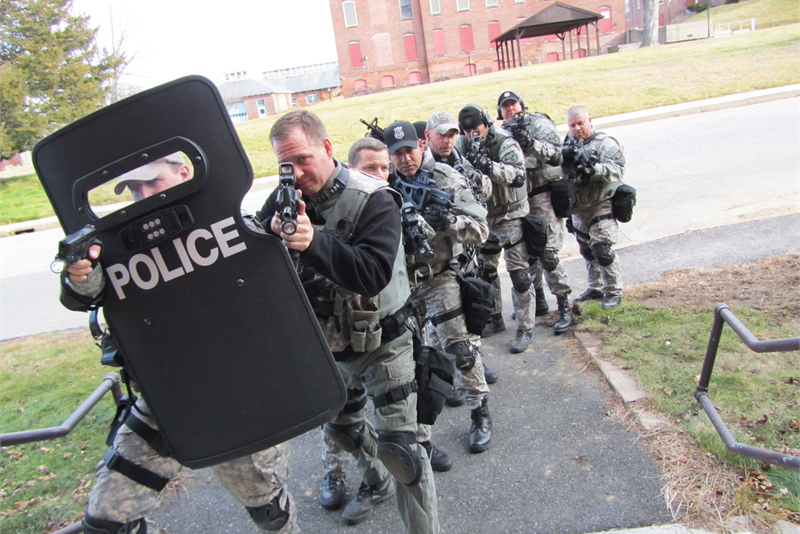 Bulletproof shield, as its name implies, is a shield with certain bulletproof ability. 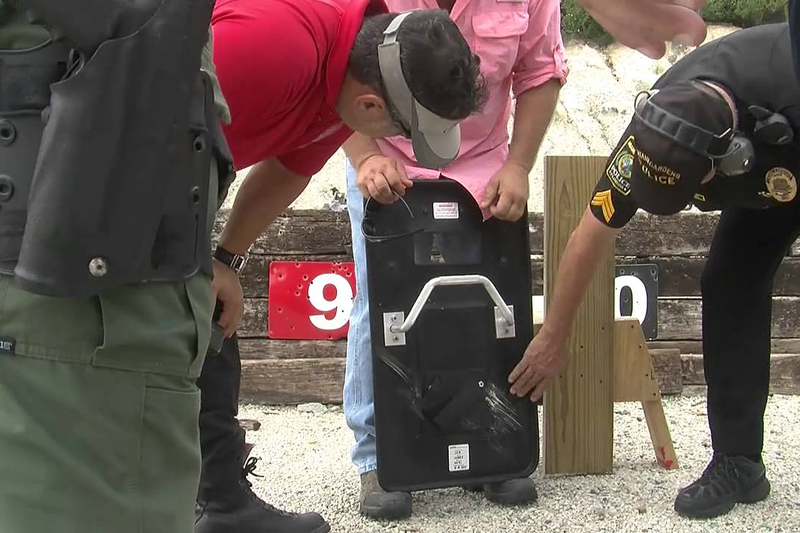 The traditional bullet-proof shield is a rectangular sheet with radian, usually with handles behind it. Whiling fighting with enemies, the holders can cover his head and body with such a shield, which can provide enough protection area for them. However, with the continuous progress of the protection industry, various protective products are also experiencing constant change. Their function, appearance, and use design are also constantly improving, and becomes more and more in line with people’s usage pattern. At present, many materials that can be used to make bullet-proof shields, including Kevlar, polyethylene, ceramics and steel plates. Based on the protection area, bullet-proof shields can generally be divided into five sizes, super-small (450mm * 650mm), small (550mm * 650mm), medium (550mm * 1000mm), large (600mm * 1300mm) and super-large (600mm * 1750mm). The National Institute of Justice has set seven levels of standards for bullet-proof shield, i.e. I, II, III A, III, IV and Special Level. Level I shield can stop 0.22 pistol bullets and 0.38 special pistol bullets; level II can stop 0.357-inch Magnum bullets and 9-mm pistol bullets (such as 9mm Barabarum bullets with higher initial velocity); Level III A can stop 0.44-inch Magnum bullets and 9-mm submachine gun bullets; Level III can stop 0.308-inch Winchester full armored bullets and 7.62-39-mm bullets; Level IV can protect 0.30-06-inch bullets, 7.62-mm NATO-made penetrators and 7.62-mm R bullets. Bullets; special grade is customized for special bullets. Special police officers have good access to bullet-proof shields, but what they use mostly are medium-sized shields, which can be equipped with tactical lights sometimes. They are mostly level IIIA, occasionally level III. According the shape and design, they can also be divided into several categories, including hand-held shields, folding shields, briefcase shields, ladder shields, and shields with trolley. Hand-held shield is the most common shield with two handles in the back, which can be used by both left-handed and right-handed users. There is usually a bullet-proof speculum to facilitate the observation of external conditions. This shield can adapt to more complex terrain and combat scenarios, such as in narrower staircases or corridors, and can also better cooperate with guns and other weapons. This bullet-proof shield is equipped with a trolley, which saves much labor for long-distance transfer. In addition, they can also be equipped with handles and speculums. As we all know, the higher the protection is, the heavier the shield is. So, a trolley is necessary to make a high-level shield be transferred easily. This kind of shields is applicable to open battlefields. When the terrain becomes complex, where the trolley is not convenient to be used, the shields can also be used alone. This shield can be transferred to be a ladder by its special structure design, which facilitates users’ climbing during a battle. In addition, there are also wheels at the bottom of the ladder shields, by which the shields can be moved freely. As the name implies, this shield is like a briefcase in appearance. But in emergency, it can be unfolded quickly into a complete shield. This shield weighs only 5 Kilograms, but is strong enough for stopping light weapons like pistols.